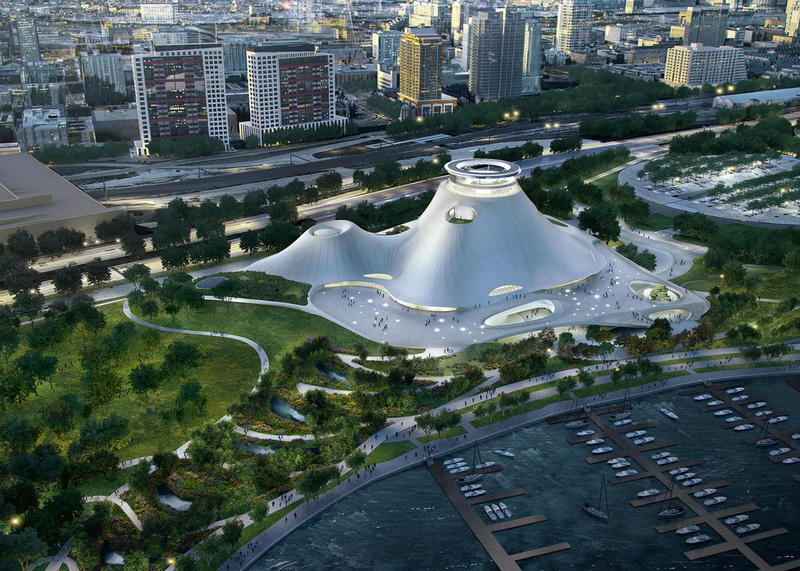 Chicago's mayor has suggested moving the proposed location for the controversial museum dedicated to film director George Lucas in order for the project to go ahead. Mayor Rahm Emanuel is trying to save the proposal, after a judge upheld the lengthy legal battle over the plan to build the museum on a lakeside car park, south of Solider Field. According to Chicago's Sun Times, his idea involves demolishing the McCormick Place Lakeside Center and constructing the museum, designed by Chinese firm MAD, in its place. The vast Lakeside Center has been dubbed "the shoreline's Berlin Wall" by The Chicago Tribune reporter Blair Kamin, who has been calling for its demolition since last year. The design for the Lucas Museum of Narrative Art was first unveiled in 2014, but MAD revised its plans for the white tent-like structure to reduce its size by 25 per cent the following year. Although Chicago City Council voted in favour of the project in October 2015, organisation Friends of the Parks is using the courts to try and block the private development, which it claims cannot be built on the public lakeside location. The project has also faced strong opposition from locals, but architect Frank Gehry waded in to defend the design after legal proceedings began shortly after it was revealed. Construction was due to begin this year ahead of completion in 2019, but the legal battle has brought the project to a halt. The museum's representatives have reportedly considered moving it to a different city, but Emanuel is determined to keep it in Chicago. However, the demolition of the 1971 Lakeside Center – designed by Mies van der Rohe protégés Gene Summers and Helmut Jahn – may also prove unpopular. Preservation Chicago included the Modernist structure on this year's Chicago Seven list of most endangered buildings in the city.